Sangre de Grado extract used by Peruvian natives as a cicatrizant agent, was collected from trees of the species Croton lechleri growing in the Peruvian jungle. The Sangre de Grado was found to contain one alkaloid identified as taspine and which was shown to be the active cicatrizant principle by an in vivo test in mice. This alkaloid exhibited a dose-related cicatrizant effect and an ED50 of 0.375 mg/kg. Experiments with taspine hydrochloride in order to study its mechanism of action in cell culture systems showed that the alkaloid was non-toxic to human foreskin fibroblasts at concentrations below 150 ng/ml and that it had no effect on cell proliferation. On the other hand, taspine hydrochloride was found to increase the migration of human foreskin fibroblasts. 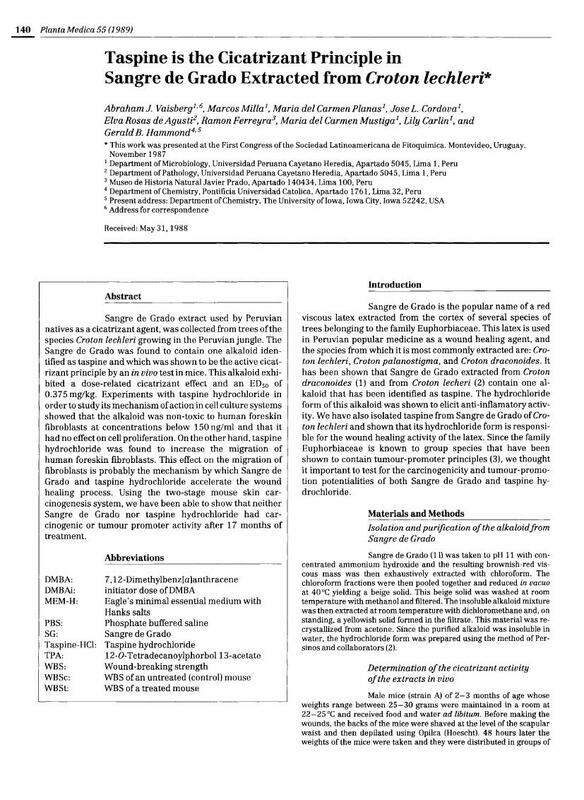 This effect on the migration of fibroblasts is probably the mechanism by which Sangre de Grado and taspine hydrochloride accelerate the wound healing process. Using the two-stage mouse skin carcinogenesis system, we have been able to show that neither Sangre de Grado nor taspine hydrochloride had carcinogenic or tumour promoter activity after 17 months of treatment.